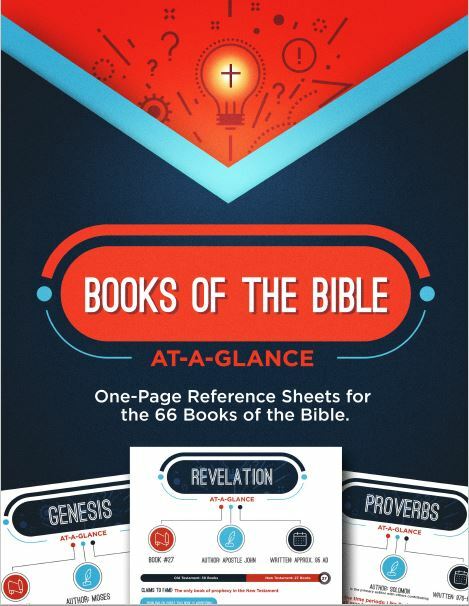 It can be tough to keep kids interested during Bible Study depending on the Book they are reading at the time so I was intrigued when we had the opportunity to review Books of the Bible At-a-Glance from Teach Sunday School. 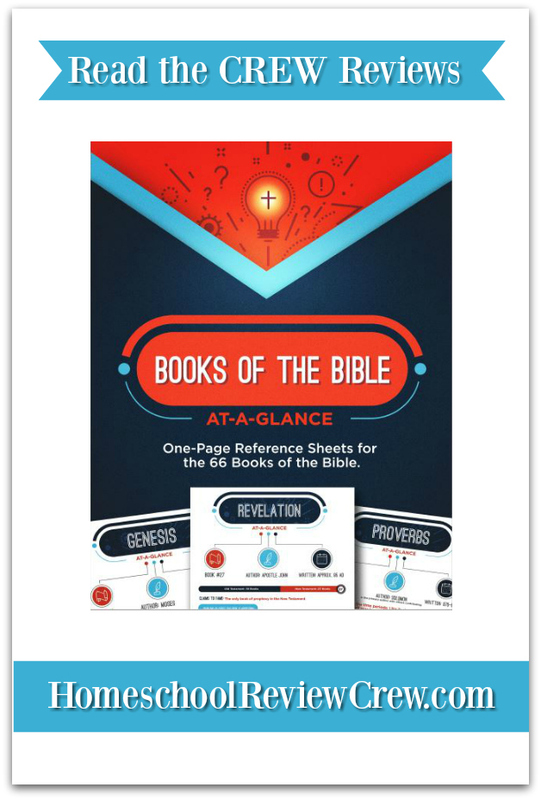 This PDF collection of information sheets contain interesting information and fun facts about all 66 Books of the Bible (not including the seven additional books of the Catholic Bible). I wasn’t really sure what to expect when we started printing out and using the sheets alongside our Bible readings but once we began, I knew they would absolutely spark conversation help us better understand the pages in front of us. We decided to begin with the New Testament and see just what information we could find in the sheets that would enhance the way we saw God’s word. Right away we found it was easy to see who had written each book, what timeline it covers, when it was written, and what easily recognized, “stand-out” stories, could be found in it. EJ really liked that he could go through the sheets and find what he was looking for. For example, he was listening to a favorite song that includes the line, “Father, forgive them, for they know not what they do.” and he wanted to know if it came from the Bible. I suggested he check our new “cheat sheets” and he quickly found the famous verse (words were a bit different) on the page for Luke. This created a learning opportunity that found us reading additional verses surrounding the quote and a conversation about people being kinder to each other and not so judgemental. A very good thing in my opinion. I found myself folding up the sheets and slipping them into my journaling Bible to use as a reference for my own readings. They have proven to be a good jumping on point for some of my writing and doodling (I get some of my best quiet time while waiting in the car for folks to finish work so these are a good addition to my bag!) Being reminded of some of this key information can really get me thinking and remembering some of my favorite verses. (I plan to print a full set to use as dividers for at least one of them.) I was actually surprised at how much I used these myself. I think there are several ways that families could use these pages. 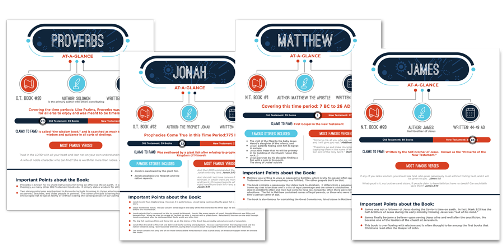 I plan on printing the entire set and keeping them in a binder so we can refer to them whenever we are doing Bible study or other Bible-related reading. The additional information will certainly come in handy. You could also post different ones on your bulletin board and have your kids search out the famous verses and stories. This will surely get them doing more reading. These pages can also be used to help us find supportive words that we may be looking for. For example, the Apostle Paul’s letters to Timothy, encouraging him and instructing him on leadership. This may be just what you need when faced with challenges in your life. I actually found reading through the pages helpful in putting together readings to go along with our homeschool religion curriculum. Overall I found Books of the Bible At-a-Glance from Teach Sunday School to be a good fit for our family. Whether used alone or fit together with our regular religion curriculum, it proved to be a handy resource that enhanced our learning. Be sure to click the image below for reviews from other Crew families. I’m sure you’ll find more terrific ideas for using this product.